Bulk edit all your SEO data like meta, urls, focus keywrods etc. Import/Export to excel. This is a must have feature for any professional SEO expert. You want to see all the SEO data in one place and be able to edit it. It should also be multilanguage too. And thanks to our API, and other module can add more fields so you really get to edit all of it. SEO editing is time consuming. And sometimes you just want to use those nice excel formulas to create SEO metas and URLs. Well now you can: just export it to excel, edit, and import back. Its that easy. And its multilanguage too. The manager is basically an api that allows you to include more SEO fields to its table and Export/Import with excel. 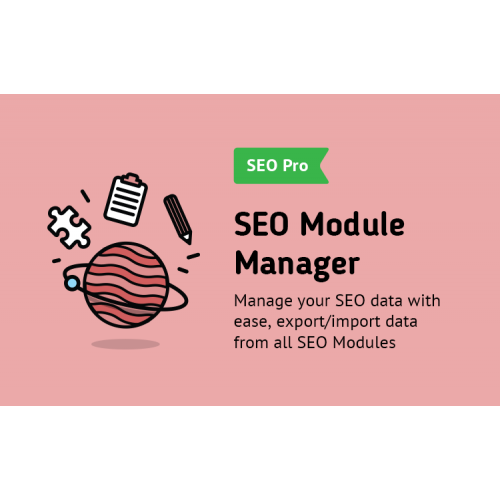 So that you really have the full control over your SEO modules. We all came to know and love this amazing feature of SEO ecosystem, yet wouldn't it be great to see the whole picture at a glance. And actually manage all of it from one location. Now you can.